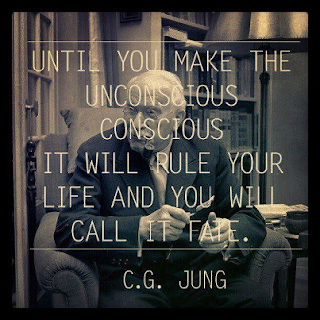 ONCE MORE WITH FEELING: Making the Unconscious, Conscious! I was awake WAAAAAY too early today. My brain has a way of waking me up because it is often busy exploring and getting excited about things much faster and much earlier than my body wants to be bothered. The summer is coming to a lazy close soon enough...and the fall is already revving up - with so many possibilities! This grabbed me in so many ways, that I had to share it with you. In the studio, I speak of technique this way. We work to summon our talent at WILL. Not at fluke. Not wishing, hoping, dreaming...(as the song goes). We work to discover what the body is capable of doing, what the body does recognize and make it CONSCIOUS. Make it CHOICE. Make it BEHAVIOR. This allows you to determine your destiny in your technical behavior instead of being fated to repeat something that does not work or cannot be summoned, or let's you down when you are nervous, tired, sick, or simply not in the studio! Many of my singers say "but I sing so much better when I am here with you". That's just because the conscious behavior hasn't yet found its destiny elsewhere. The behavior simply needs more time to become...behavior. Uhm, practice. Repeating a desired skill carefully, with consciousness, to allow it to become unconscious and move back into subconscious to become habitual behavior. Fate vs Destiny in our technique, and in the reality of what we are working with and where we are, can all become conscious; can all become decision and therefore creative destiny! The blame game never acknowledges that the self could be responsible. Responsible for simply BEING THE BEST SELF in whatever circumstances one finds. Circumstances DO shape certain things, but they do not have to FATE them, if the singer chooses - and I do mean CHOOSES - accept responsibility for becoming conscious. Does it take work? yep. Can it get messy? sometimes. If all you think about is becoming famous, or being a celebrity, then none of this will make sense to you. The conversation you are having with yourself simply does not commute or recognize what I am talking about here. However, if you are committed to discovering your best self, and better than your previous self, and where you are best suited to be in your pursuit of craft, then I think on some level, you KNOW what I am talking about. Fate means, poor me, why me, people make me feel like I am not enough, I hate people who seem xyz...everything is deflected. Nothing is internalized. Isn't the same with the consciousness or lack thereof, of developing a true sense of technical behavior? Fate means excuses. Fate means blaming a teacher or a coach. Fate means never taking true ownership. Destiny, however creates possibilities. It is recognizing that perhaps things aren't working ideally, that you have had to survive poor or bad teaching, but you are conscious enough to want to work toward MORE. Not more RECOGNITION but more REALIZATION. Destiny is internal. It deals with what is unconscious, or subconscious, or even pre-conscious, and works to discover how to create behavior to make it fully conscious. When that consciousness is realized, you can discern what is YOUR responsibility, what is in YOUR control, and what you want to do with it, within your circumstances, and your means. Consciousness then allows you to see ALL your behavior - the good, the bad and the ugly - and how it affects your conversation with yourself. Again it is a choice: fate and blame, or destiny and possibility. The truth will set you free. Fame and celebrity do not. Pretending and hiding in plain sight do not. Dare to create consciousness in your conversation, and in your technical behavior!